Veterinary theriogenologists are specialists with advanced knowledge of reproductive medicine and surgery. Veterinary theriogenologists are veterinarians with advanced training in reproductive medicine. Routine responsibilities for a theriogenologist in private practice include performing breeding soundness exams and pregnancy checks, pre-surgical exams, and diagnostic tests, performing surgical procedures to correct reproductive issues, compiling case reports, and overseeing veterinary technicians or other support staff. In addition to private practice careers, some veterinary theriogenologists may teach courses at a veterinary school, conduct and publish research studies, develop new medical devices and diagnostic tests, or provide consultations at the request of a general practitioner. Theriogenology is one of the specialties in which veterinarians can achieve board certification. Veterinary theriogenologists may choose to specialize in working with one particular species or category of interest such as large animal, small animal, equine, bovine, or exotics. Theriogenologists may work as clinical practitioners, researchers, lecturers at veterinary colleges, or in private industry positions. Veterinary theriogenologists must start on their career path by being accepted into veterinary school to complete a Doctor of Veterinary Medicine degree. After becoming licensed, a vet can begin the path of study that leads to board certification in the specialty field of theriogenology. To be eligible to take the board certification exam, a candidate must fulfill several requirements. The candidate must complete at least three years of experience in the field under the supervision of a theriogenology diplomate. This experience must consist of 1 year of clinical practice and two years of additional training through an approved residency program (consisting of teaching, research, or practice of theriogenology). There is also an alternative clinical practice path to the board certification exam for those not wishing to complete a residency, though this pathway is a six-year endeavor. Upon passing the board certification exam administered by the American College of Theriogenologists (ACT), which consists of a combination of multiple-choice and essay questions, a veterinarian will be granted diplomate status in the veterinary specialty of theriogenology. On average, 10 to 20 new diplomates in veterinary theriogenology are certified by the ACT each year. According to the American Veterinary Medical Association, there were 379 ACT diplomates in a 2011 veterinary specialty survey. Diplomates must also complete continuing education credits each year to maintain their board-certified status and to keep abreast of advances as they are made in the field. The Bureau of Labor Statistics (BLS) reported a median annual wage of $82,900 for all veterinarians in the survey of May 2010. The lowest ten percent of all veterinarians earned a salary of less than $50,480 each year while the highest ten percent of all veterinarians earned a salary of over $141,680 each year. The BLS does not separate specific salary data for each of the veterinary specialties, but board-certified specialists would tend to earn salaries towards the top end of this range due to their extensive experience and qualifications. DVM Newsmagazine reported that the American Veterinary Medical Association’s Biennial Economic Survey of 2009 found that theriogenologists earned a mean salary of $109,618. Amongst the veterinary board-certified specialties, this specialty ranked the lowest on the salary scale (with veterinary ophthalmologists earning the highest compensation amongst the specialties, pulling in a mean salary of $215,120). The 2011 AVMA Report on Veterinary Compensation found that board-certified theriogenologists earned a median salary of $121,000 and a mean salary of $132,603. Those in the 25th percentile of earnings brought home $103,000 per year, while those in the 90th percentile of earnings brought home $207,000 per year. Aspiring theriogenologists do also earn a salary while completing their residencies, though this compensation is much less than a veterinarian would earn in clinical practice. Residency salaries generally range from $25,000 to $35,000 per year. 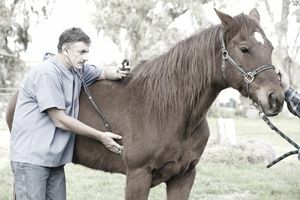 The Bureau of Labor Statistics (BLS) does not separate the specialty of veterinary theriogenology from salary data collected for the category of all veterinarians, but BLS survey results indicate that the veterinary profession as a whole will show steady, stable growth over the decade from 2010 to 2020. The results project a steady rate of growth at approximately 36 percent for the field of veterinary medicine, a much faster rate than the average rate of growth for all professions. Veterinarians who achieve board certification should continue to have particularly strong job prospects in the field. The rigorous nature of specialty training programs and board certification exams ensure that only a small number of professionals are able to achieve board certification each year. The ACT reports that, on average, only 10 to 20 candidates achieve board certification in the specialty of theriogenology each year. Demand for theriogenologists will only be strengthened by the limited number of board-certified professionals in this veterinary specialty.